Valuable tools to study BEFORE buying a saddle! We are ecstatically happy that more and more Icelandic Horse owners are concerned with obtaining good saddle fit as a number one priority for their horse! When Icelandic Horses were first introduced into North America, it was assumed that they needed "icelandic" saddles. Over the years, it has been found that the icelandic saddles may not be the best fitting saddles, and may be uncomfortable for the Icelandic Horse. Iceland is a very small country, and has been isolated for many years, therefore not quite up to date on technological advances in saddle fitting and equine biomechanics. It has been found that the saddles tend to sit the rider over the weaker part of the horse's back (behind the rider's groove), are narrow in the front, and do not allow for good shoulder movement. Saddles that are narrow in the front, and that have extended panels that dig into the loins force the horse to take a ventroflexed (hollow) frame. These types of saddles are referred to as the D & P (dig and pinch) saddles. Fitting the pony, who may have a shorter back than a regular sized horse, is a delicate balancing act! We need to have a saddle with enough room for the withers, shoulder room, and yet not set back on the back. Icelanders and Europeans tend to set the traditional saddle further back to free up the shoulder movement rather than making a saddle that "allows" for shoulder movement. They also believe, incorrectly, that the rider "should" sit on the back of the saddle. Several years ago, it was unheard of to even think of riding an Icelandic Horse in other than an "icelandic" saddle. We started submitting saddle fitting information to the Icelandic Horse email discussion list, along with options for other saddles such as the Wintec, Bob Marshall Sports Saddle (treeless), Balanced Ride saddles, Free n Easy flex tree saddle, etc. And we now have many horses who have found relief with better fitting saddles. Les Spark, of Free n Easy, has some great saddle fitting information on his website and graciously allowed us to post that information to the email discussion list. Two of the endurance horses recently switched to the Free n Easy and are, according to their owner, running faster and tolting better. Other owners, myself included, have the treeless saddle which has allowed our horses to have freedom of movement and better gaits. Neither of these saddles are for every horse. 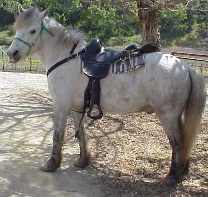 The point is to find a saddle that fits the horse, fits the rider, fits the discipline. If you aren't competition riding, no sense in having an ill-fitting saddle just because it's "icelandic". We are SO grateful to the Icelandic Horse owners / breeders / trainers who have stepped outside of the box and considered their horse first and foremost, read the submitted saddle fitting information, and took a chance of being "different". The general concensus several years ago was that people liked the Bob Marshall Sports Saddle along with a Skito Pad (for the air channel for the spine clearance). Now the Sensation is becoming very popular with Icelandic Horse owners. (f) The weight must be evenly distributed over a surface which extends from the play of the shoulders to the last true rib. The saddles that have extended panels (either "Icelandic" or "Gaited" horse saddles) dig into the horse's loins... not a good thing! These saddles became popular before it was understood about how they worked and the damage they can do. Avoid these saddles, or they may cause behavior problems, an unwillingness to work, or unsoundness in your horse. 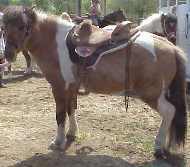 Most American Icelandic Horse owners have gotten away from using the icelandic saddle due to poor fit and back problems caused to the horse. Their alternative choices have been anything from English to Aussie to Western to treeless saddles to flexible tree saddles. The first thing to do to fit an Icelandic Horse is to understand saddle fitting. More information about saddle fit can be found on the IceHorses Email List archives. The best saddle for the Icelandic Horse is one that fits well, first of all; secondarily, one that fits the rider and the discipline. To contact us, please go to the Contact Page.